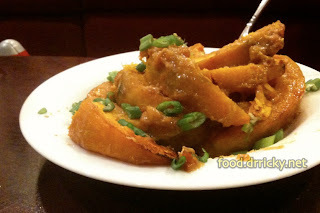 Kabocha is a type of winter squash, often called a Japanese pumpkin. It's usually green on the outside, with a yellow flesh. 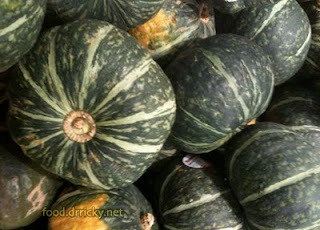 It is texturally firmer when cooked compared to other winter squashes, and also has a pleasant, sweet potatoish flavor. And a good foil for the umami of miso. In this preparation, take a small kabocha squash, and peel it. 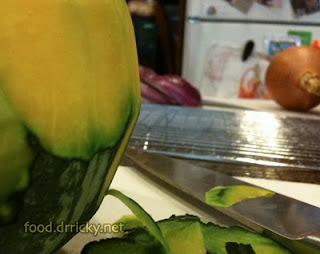 This takes a good sturdy sharp knife, but even so, you can cheat by par-baking the squash. That means sticking it in a hot oven for about 10-15 minutes, and then cooling it. This softens the outside enough to peel easily, but won't cook it through just yet. Cut it open, and remove the seeds and "guts" :). Cut into wedges, and throw into a plastic bag. In the meantime, make a mixture of miso, mirin, grated ginger, brown sugar, sesame oil, and salt. Some cayenne would be good, too, if you want some heat. Pour this into the bag, and squish it around, making sure that the squash gets coated well. Pour it out onto a parchment or foil lined sheet pan, arrange the slices into a single layer, and put into a preheated hot oven - 200°C should do nicely - and cook for about 15 minutes, or until the outside caramelizes into a nice glaze. Sounds excellent - I'm going to try it with sriracha.